Jamaal Rolle, known as The Celebrity Artist, was delighted by widely viewed photo of Asahd Khaled’s reaction to seeing his portrait. NASSAU, BAHAMAS, July 13, 2017 /24-7PressRelease/ — Jamaal Rolle, known as The Celebrity Artist, is an award-winning Bahamian visual artist who is famous for his lifelike portraits of world figures, government officials, and A-list celebrities. Notable previous subjects, include: Pope Francis, Prince Harry, Oprah Winfrey, Michael Jordan, Johnny Depp, Mark Wahlberg, Justin Bieber, Taylor Swift and Katy Perry. However, it is likely that none of these famous personalities have reacted in a similar way to baby Asahd Khaled, possibly the youngest of Rolle’s subjects. 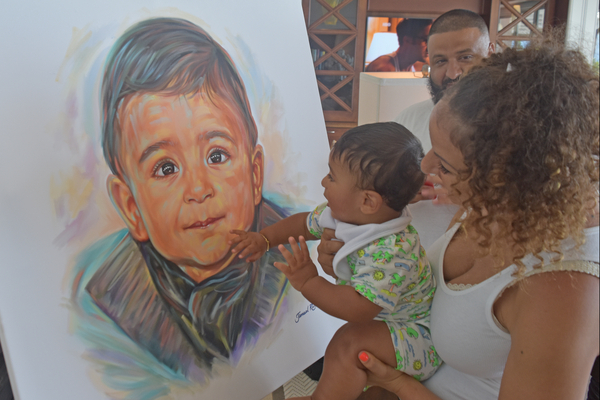 Baby Asahd’s father, DJ Khaled, first met Rolle in 2016 when Rolle was commissioned to paint a special portrait to commemorate the success of Khaled’s number one album, Major Keys. This year, Rolle was commissioned to paint baby Asahd, the ‘executive producer’ of Khaled’s new album, Grateful. Meeting Rolle for the first time, Asahd became visibly excited, kicking his legs in an attempt to get a closer look at his portrait. The photo shows Khaled’s fiancee, Nicole Tuck, holding baby Asahd as he looks in awe at the portrait. Posted on Instagram and Facebook, the photo shows Khaled smiling at both Tuck’s and Asahd’s reactions. “Asahd, this famous artist made a nice portrait of you, to welcome you to the Bahamas,” said Khaled in a video capturing Asahd’s first look at his first celebrity portrait. To view more of Jamaal Rolle’s work, follow him on Instagram: @thecelebrityartist.